Vatican City, Jan 25, 2018 / 10:51 am (CNA/EWTN News).- At an ecumenical Vespers service Thursday, Pope Francis told members of several Christian communities that the grace of Baptism creates a unity in the family of God. 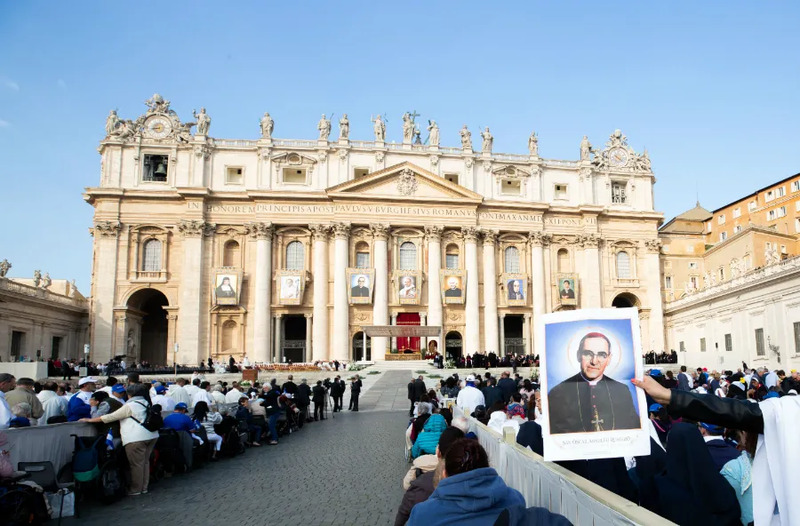 Vatican City, Oct 14, 2018 / 05:19 am (CNA/EWTN News).- “Jesus is radical,” Pope Francis said in his homily at the canonization of Pope Paul VI, Oscar Romero, and five other new saints. “He gives all and he asks all: he gives a love that is total and asks for an undivided heart,” the pope told the pilgrims gathered in St. Peter’s Square Oct. 14. Christ “gives himself to us as the living bread; can we give him crumbs in exchange?” the pope asked. Francis officially recognized Pope Paul VI, Oscar Romero, Vincent Romano, Francesco Spinelli, Nunzio Sulprizio, Nazaria Ignacia March Mesa, and Maria Katharina Kasper as saints at the Mass. “All these saints, in different contexts, put today’s word into practice in their lives, without lukewarmness, without calculation, with the passion to risk everything and to leave it all behind. May the Lord help us to imitate their example,” Pope Francis said at their canonization. Oscar Romero, who was beatified by Pope Francis in El Salvador in 2015, was the archbishop of the nation’s capital city of San Salvador. He was shot while celebrating Mass March 24, 1980, during the birth of a civil war between leftist guerrilla forces and the dictatorial government of the right. 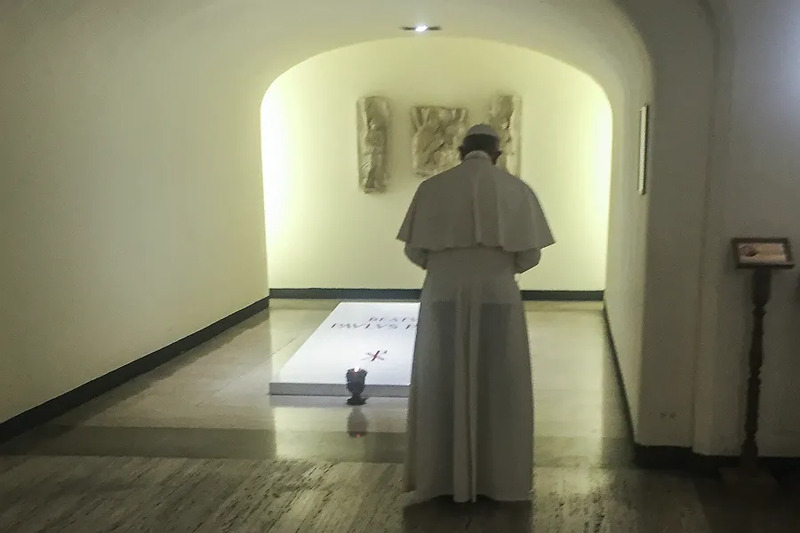 Saint Oscar Romero “left the security of the world, even his own safety, in order to give his life according to the Gospel, close to the poor and to his people, with a heart drawn to Jesus and his brothers and sisters,” Pope Francis said in his homily Sunday. “Let us ask ourselves where we are in our story of love with God. Do we content ourselves with a few commandments or do we follow Jesus as lovers, really prepared to leave behind something for him?” the pope asked. Pope Saint Paul VI, like St. Paul, his namesake, “spent his life for Christ’s Gospel, crossing new boundaries and becoming its witness in proclamation and in dialogue, a prophet of a Church turned outwards, looking to those far away and taking care of the poor,” Francis said. As pope, Paul VI oversaw much of the Second Vatican Council, which had been opened by Pope St. John XXIII, and in 1969 promulgated a new Roman Missal. He died in 1978, and was beatified by Pope Francis Oct. 19, 2014. Apart from his role in the council, Paul VI is most widely known for his landmark encyclical Humanae Vitae, which was published in 1968 and reaffirmed the Church’s teaching against contraception in wake of the sexual revolution. This year marks the 50th anniversary the encyclical. “Pope Saint Paul VI wrote: ‘It is indeed in the midst of their distress that our fellow men need to know joy, to hear its song,’” Pope Francis said. “Today Jesus invites us to return to the source of joy, which is the encounter with him, the courageous choice to risk everything to follow him, the satisfaction of leaving something behind in order to embrace his way. The saints have travelled this path,” he continued. “Let us ask for the grace always to leave things behind for love of the Lord: to leave behind wealth, the yearning for status and power, structures that are no longer adequate for proclaiming the Gospel, those weights that slow down our mission, the strings that tie us to the world,” he said. “Without a leap forward in love, our life and our Church become sick from ‘complacency and self-indulgence,’” he continued. 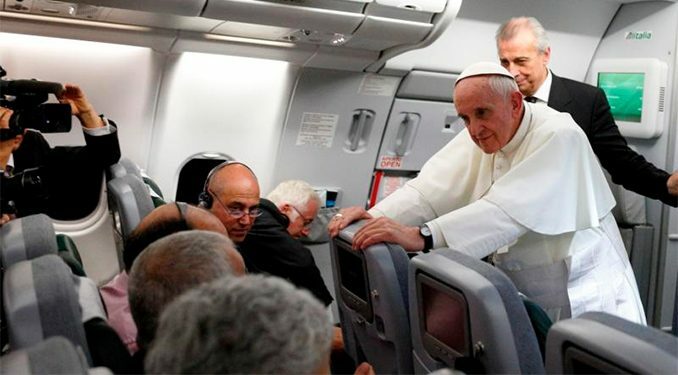 “The problem is on our part: our having too much, our wanting too much suffocates our hearts and makes us incapable of loving,” the pope said. At the Sunday Angelus following the Mass, Pope Francis greeted Queen Sofia of Spain and the presidents of Chile, El Salvador, Panama, and Italy, who attended the canonization Mass. The canonizations took place midway through the 2018 Synod of Bishops on the topic of young people, the faith and vocational discernment from Oct. 3-28.